Researchers at Purdue University have made an advance in stretchable electronics that could lead to computerized clothing and robots with humanlike skin that can "feel." The issue has been how to create stretchable electronics, but the Purdue scientists have found a simple answer -- a sewing machine. The same sewing machine that you use to make your child's Halloween costume or to stitch together a pair of curtains is the same machine that can make what scientists call ultra-stretchable interconnects out of conventional wire. The sewing machine uses a water-soluble thread to stitch the wire into a zigzag pattern. Since it's difficult to sew the wire into the rubbery material, scientists worked out a technique to, instead, stitch the wire into a sheet of polyethylene terephthalate, the material used to make transparencies for overhead projectors in classrooms. Once the wire pattern is stitched to the sheets, a rubbery elastomer material is poured over the sheet, encasing the wire as it solidifies. Warm water is used to dissolve the thread and separate the polyethylene sheet from the rubbery material that now holds the wire. The basic sewing machine is a feasible alternative to more complicated and expensive techniques that other researchers have investigated, according to Purdue. Some scientists have tried to use microfabrication techniques or exotic technologies like liquid-metal-filled microchannels to attain the same results. The stretchable electronics are capable of stretching 500% of its length, Purdue said. "This compares to only a few percent for an ordinary metal connection," said Babak Ziaie, a Purdue professor in the School of Electrical and Computer Engineering and the Weldon School of Biomedical Engineering. "The structures are also highly robust, capable of withstanding thousands of repeated stretch-and-release cycles." Scientists have been trying to create stretchable electronics that can be used in computerized clothing that people might use to access the Internet, store data and monitor the wearer's health. 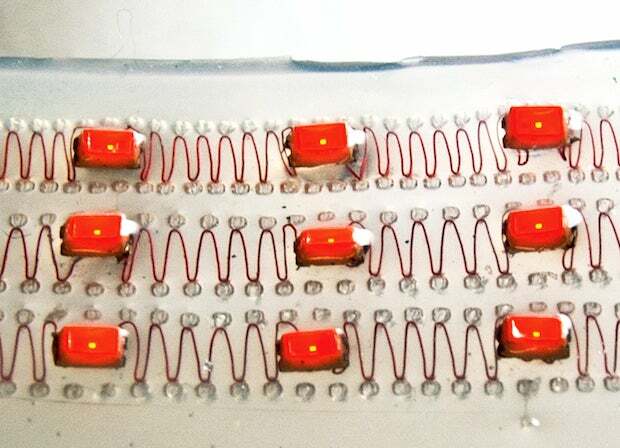 While the material could be used to create robots with sensors in their skin and synthetic muscles, it also could be used to build implantable medical systems or devices. This article, Stretchable electronics could lead to robotic skin, computerized clothes , was originally published at Computerworld.com.